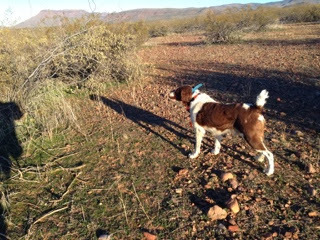 A Bird Hunter's Thoughts: Gambels Quail in Arizona- Running Devils. 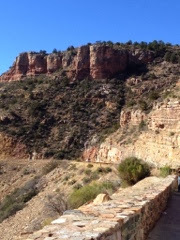 The drive from Oklahoma to Arizona is worth the ticket price! I loved every minute. Beautiful scenery and good road kept the trip interesting and was good for the dogs, as well. Smooth roads keep them rested. Gambels country that we hunt has bed described as land where everything either pokes, stings or bites you. I'm here to confirm that is correct. 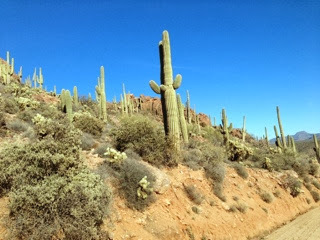 However, add it is hot(or cold) and dry as a bone and the dirt is volcanic ash that is like running on sandpaper. 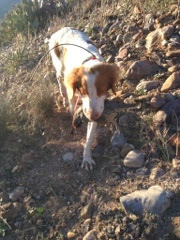 Over time, it will wear down dog pads leading to worn spots and limping hunters. Local dogs can overcome this with toughened pads, but out of towners, like mine, no matter how well prepared, will need boots and some real care and attention to assure their feet don't become a problem. Remember to hydrate yourself, too. It's amazing how much water you can lose and not feel it. If I'm not careful to hydrate well, I'll wake up in the middle of the night craving water, with cramping quads, rolling out of bed holding my leg, usually my right one, and cussing my stupidity for not drinking more water. 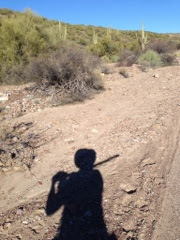 Ruby did some excellent work on singles north of Globe, Arizona. I was so impressed with her this day. 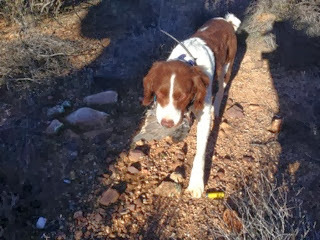 Great find and retrieve in very difficult conditions. Here's my Cap. He's got the covey nailed and is swearing they are "Right there, Boss!" They were, indeed, right there and we had some fine shooting for a while until they managed to escape. At the end of the day, we really hated to leave Gambels country, but the Mearns were calling. 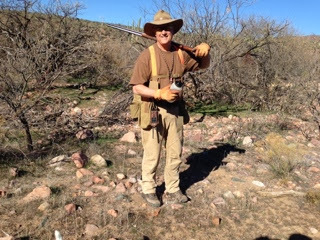 We headed farther south, at times only a mile to so north of the border, and went after the most elusive of the North American Quail- Mearns, or Harlequin quail.